Featured Image: Secret Stone Towers off the Himalayas. Source: Stone Stacker. 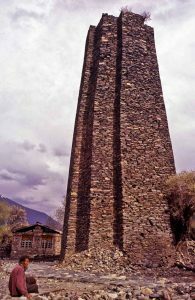 The Himalayan Towers are a series of stone towers located mostly in Tibet. Carbon dating shows they were built approximately 500 to 1,100 years ago. Since they are generally located in prosperous villages, it is believed that their primary function was as a demonstration of a family’s prestige within the community. For strength, many of the towers use a star pattern of walls as opposed to a strictly rectangular method. Heights can exceed 60m. For more information see the work of Frederique Darragon.